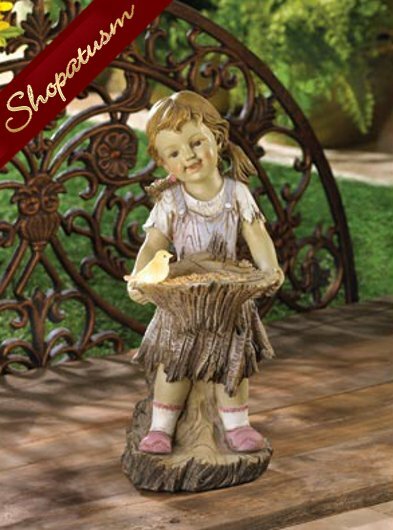 This is for a sweet summertime girl solar light garden statue from Shopatusm. A rosy cheeked girl and her friendly feathered companion get ready to gather a summer bouquet. Lovingly fashioned to resemble hand carved wood; a special hidden solar light provides a lovely after-dark glow. Weight 2.5 lbs. Polyresin. Solar powered battery included. 6 inch x 5 1/2 inch x 14 1/2 inch high.